*Holiday Club at Chevron Renaissance* sets new level of luxury and contemporary lifestyle for other Gold Coast resorts to aspire to. 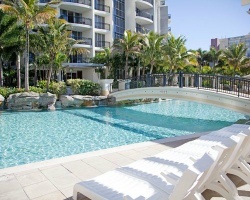 The centerpiece of this towering property its "Beaches In The Sky"- a 600 metre square outdoor swimming pool located on the 5th level of the resort, complete with sandy beaches, rocky outcrops, subtropical gardens, whirlpool spas, and a bridge! The resort also boasts a health pavilion, 18-seat movie theatre, and direct access to fine shopping and restaurants. For more information about this resort, visit www.holidayclubpacific.com. 28,400 points available now! Will negotiate!